This is my best skin so far. It has all the basic buttons(play, pause, stop, previous, next). All the buttons have a nice glow/fade effect when you mouse over them. 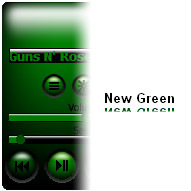 It also has A visualisation window, a playlist window and a quick access menu. It has a video window which pops up when you're playing a video. I hope you like it! Please comment on it, or if you have any suggestions write them down. Thanks.